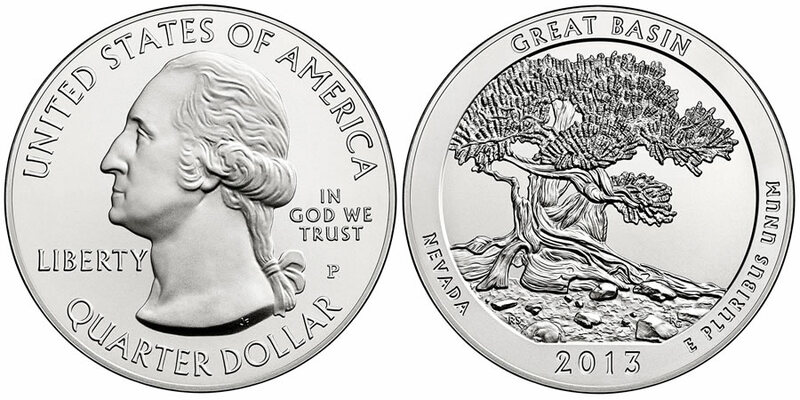 Issued by the United States Mint in 2013 as part of the America the Beautiful Five Ounce Silver Uncirculated Coin™ series is the 2013 Great Basin Silver Uncirculated Coin. A design located on the reverse of the strike is emblematic of Great Basin National Park located in the state of Nevada. This coin is offered by the US Mint as the third of five 2013-dated strikes of the series. It contains the same basic designs as found on the related Great Basin strikes of the America the Beautiful Quarters® Program and the America the Beautiful Bullion Coins. In appearance, the coin most closely resembles the related bullion coin which is struck from five ounces of .999 fine silver with a diameter of three inches - the same basic specifications as this release. The easiest way to tell this uncirculated coin apart from the bullion coin is to look for a mintmark. A 'P' mintmark is included on the uncirculated coin whereas the bullion coin has no mintmark. Great Basin National Park is located in the state of Nevada and was only established in 1986. The park consists of approximately 77,000 acres found about three hours north of Las Vegas. Found on the obverse of the coin are the inscriptions of UNITED STATES OF AMERICA, LIBERTY, IN GOD WE TRUST and QUARTER DOLLAR surrounding a portrait of George Washington, the first President of the United States. This portrait was originally designed by John Flanagan and featured on the 1932 circulating quarter dollar. Located on the reverse of the coin is the design emblematic of Great Basin National Park. That design is surrounded by the inscriptions of GREAT BASIN, NEVADA, 2013 and E PLURIBUS UNUM.